The Shabby | A Quilting Blog by Shabby Fabrics: Designer Focus: Holly Holderman of Lakehouse Dry Goods & TWO Giveaways! 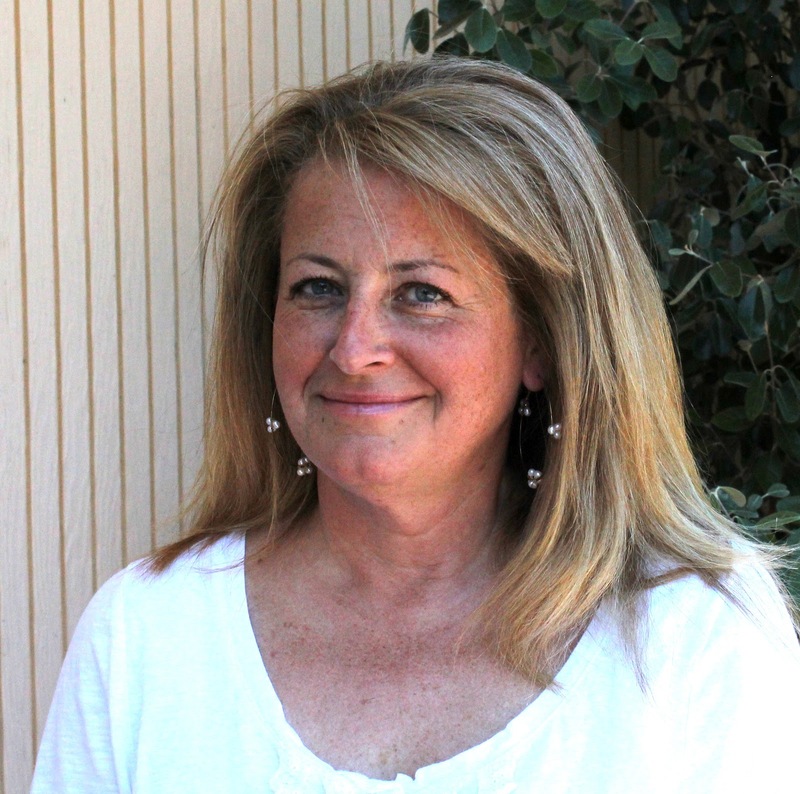 Designer Focus: Holly Holderman of Lakehouse Dry Goods & TWO Giveaways! Someone once said to me "it's all downhill after Paris", as in,"everywhere you travel to in Europe will just not be as fabulous as Paris"...I guess that's why I rely on Paris & all things French when I want to be inspired & fill my heart with happiness. Paris is a city for people like me who love to walk (and take in the local color in the cafe's that are on practically every block). The Eiffel Tower, the tea shops, lovely shop windows, rose gardens (seemingly everywhere, even in secret courtyards...you'd just happen upon), flea markets (bits & scraps & inspiring treasures...), incredible buildings...beautiful doorways, multi-paned windows, parquet floors, giant doors with door knobs so big that you need two hands to open them...and oh, the spoken word, "Oo La La". Before starting LakeHouse Dry Goods I went to Paris about twice a year; we were just LakeHouse a design licensing studio back then...the pace was a little more hectic. I needed to charge my "design battery" a lot. We did everything from Christmas ornaments to popcorn tins, stationery, hatboxes, wallpapers (and seemingly anything that had a surface design on it). We showed our collections to hundreds of businesses at Surtex in May each year at the Jacob Javits Convention Center in New York, so designing for fabric is a relatively new thing for me. I'm getting excited about going back to Paris...oddly enough, it was my boyfriend Paton who suggested it. "Penelope 4, 5 & 6" is for me a nostalgic extension of my lifelong love affair with Paris, I am so humbled to be able to bring you these fabrics, inspired by a place which means so much to me. 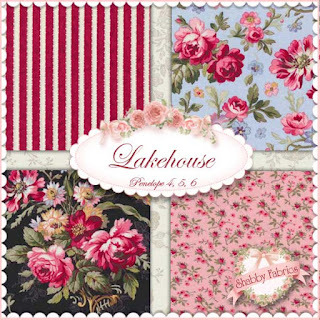 The newest fabric collection from Lakehouse is Penelope 4, 5, 6. These beautiful fabrics feature gorgeous florals, bright colors, and an unmistakable touch of French inspiration! We have just made kits for two of Holly's designs featuring the above fabrics. 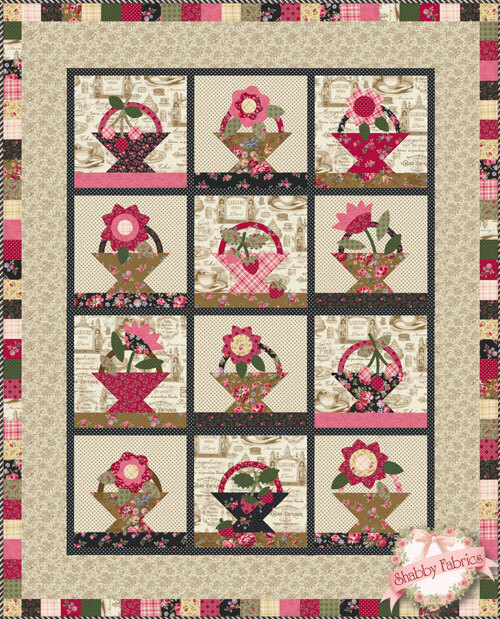 Scrap Happy Basket Quilt features twelve delightful baskets and is a fusible applique project. 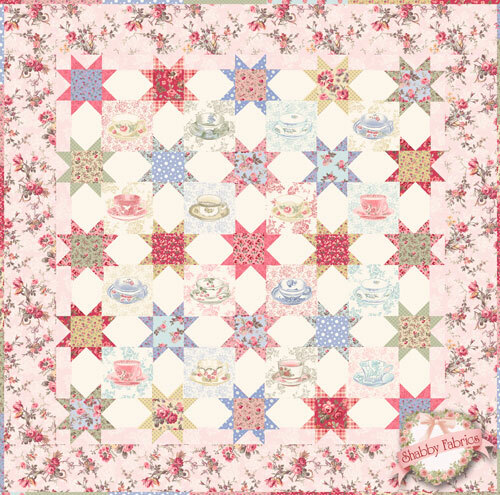 Teacup Star Quilt is a beautiful pieced wallhanging featuring teacup panels! There are not one, but TWO giveaways this week for a total of twelve prizes! 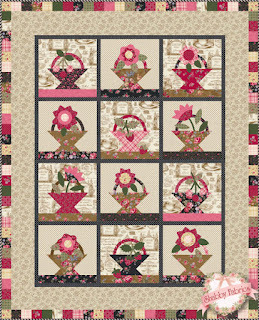 Shabby Fabrics is giving away patterns designed by Holly Holderman: Teacup Star Quilt and Scrap Happy Basket Quilt. 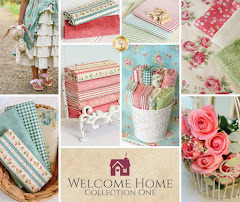 Holly Holderman is giving away FQ bundles of the Penelope 4, 5, & 6 collection. First, sign up for the Shabby Fabrics email newsletter here, and come back and leave a comment letting us know you've done so. Make sure your email address is included (or is connected to your Google account) so we can contact you if you win! Then, go to Holly's Blog and leave a comment. That's it! You are now entered to win one of 12 great prizes! Winners will be announced Friday, July 13. I already am signed up for the newsletter! Just signed up for the newsletter!! I'm signed up for the Shabby Fabrics newsletter. Thanks! signed up for Shabby Fabrics newsletter, thanks! I love the Shabby Fabrics newsletter. I've been receiving it for while. Now I am off to visit Holly's Blog. Am already signed up for the newsletter. And left a comment for Holly. Thanks for the wonderful give-away! I am already receiving your newsletter, thank you. I love this new fabric. I already receive the newsletter. Love the fabric! I already receive the Shabby Fabrics' newsletter. Já recebo o boletim the Shabby. All signed up. I adore this lake house line...totally! Just updated my newsletter info. I am so excited about this giveaway as I've been looking longingly at it. Thank you for the chance Jennifer. I already get your newsletter. I already receive the newsletter. Thank you for the generous giveaway. I already receive the newsletter. The patterns and fabrics are great! I already receive the newsletter - what a fantastic giveaway. Thank you! I am a subscriber to your newsletter - great giveaway. Already receive your wonderful email newsletter! I have been signed up for the newsletter for ages!!! Thanks! I already receive your newsletter and love it! Thanks for the chance!! I already receive the newsletter too...and I love seeing what's new! I have enjoyed your site for quite some time now. My wish list just keeps getting longer. I enjoy yor emails. My wish list just keeps getting longer. I signed up for the newsletter a while ago. I have already subscribed--thanks for hosting such a great give away! just signed in for the newsletter. How gorgeous are they!!! How generous is this giveaway! Thanks so much for giving us all a chance to win. I am already receiving your newsletter, thanks! Ihave just subscribed to the newsletter. I love the baskets and the teacups - what a fabulous giveaway! I already subscribe to your newsletter. This is such a great giveaway - thanks so much for the chance to win. I too am a subscriber to your newsletter! LOVE IT!! Thanks for the chance to win! Yes I signed up for your newsletter. Thanks for the chance. I love The Shabby newsletter. I'm already a recipient. Thanks for the giveaway! I already follow your blog and receive the newsletter! I love Penelope and can't wait to get my hands on some! I already get your wonderful newsletter and wouldn't miss it. So inspiring. I already receive your lovely newsletter and drool over each edition! I already receive your newsletter. thanks for the giveaway. off to Holly's blog. I like your blog! I already subscribe! i do get the newsletter :) and follow your blog, too! I`ve already received your newsletter and also follow your blog.Thanks for the giveaway!! I think I was already set up to receive but I re-did it! I already receive Shabby email newsletter. Love this giveaway. Receive your newsletter and follow your blog. Can't help but love Penelope as it is so beautiful and my name. Thank you for a chance to win one of the lovely patterns. I just signed up for your newsletter. The fabric is beautiful. Thanks for the opportunity to win one of the great patterns. I already receive the Shabby Newsletter...and love it! Thanks you! I receive the Shabby Fabrics newsletter. Thanks! I am receiving the newsletter. Thank you for the giveaway! I already receive the newsletter. What a wonderful giveaway! Happily, I already receive your newsletter! 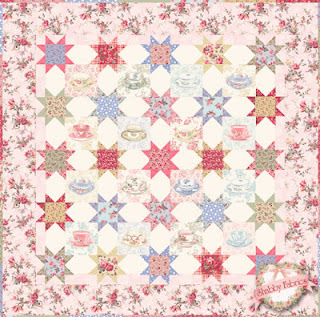 I love the Teacup Star Quilt. I already receive the Shabby Fabrics newsletter. Thanks for the chance. Great giveaway! I already subscribe to your newsletter. I got my first newsletter today. Love Penelope 4, 5, 6--my sister's name. What a great giveaway. Love the new patterns. I'm a long time subscriber to your newsletter. Thanks for a chance to win. I already subscribe to your newsletter. Love the fabrics! Thanks for the giveaway! Awesome giveaway! I love Holly's fabrics. I am a newsletter subscriber. Thank you! Thanks for the giveaway, I have been a subscriber for quite awhile. I am already on the newsletter list! I absolutely love Holly's fabrics! I left a comment on her blog. I already subscribe to Shabby Fabric's newsletter. I allready receive the newsletter!! So loving it. Thanks for this great giveaway. I do receive your informative newsletter and thank you for a chance to win. I love Holly's fabric and already receive your newsletter. I recieve your wonderful newsletter, and am a great fan of Holly and her fabrics! Thanks for the opportunity! I love your newsletters, the format is fun, very easy to read, and catches the eye for the latest new items. Lakehouse is a great addition and the collection is wonderful I love the reds! I have enjoyed your newsletter for some time now. Thank you for steering us over to Holly's blog. I updated my profile. I love the basket quilt. I do get your newsletter and enjoy it. I updated my profile. The fabrics by Holly are beautiful. Holly's fabrics are wonderful. I look forward to your newsletters. I have been receiving the Shabby newsletter for quite awhile now. Thanks for the opportunity to enter your wonderful giveaway. I already receive your email newsletters (and love them). Thank you for showcasing Holly because she's one of my favorite designers! I am a happy newsletter subscriber! Thanks for the chance to win! Holly's fabrics are gorgeous! Thanks for the chance to win. I am a subscriber to your Newletter and dashed over here when you mentioned Lakehouse fabric. My fav! I subscribe to your newsletter with great delight. found for us! also, Lakehouse is my most favorite of all the fabric lines! The giveaway is so nice.. I have signed up receive your newsletter. I always look forward to seeing what beautiful things you have. I'm already signed up for your newsletter and I love Lakehouse fabrics! Thanks for the giveaway. Love Shabby Fabrics website and newsletter. Lakehouse Dry Goods produces absolutely fabulous fabrics. Would be ecstatic to win one of Holly's patterns - especially the delightful Scrap Happy Basket Quilt. I am already signed up for your newsletter. Thanks for the chance to win! I'm signed up and ready to win!! I'm so excited and can't wait, I would just love, love, love to win this beautiful fabrics...I am visualizing such a beautiful quilt right now... Thanks so much for the chance! I already subscribe to your newsletter -- enjoy it very much! Told Holly how much I enjoyed her description of Paris. No wonder her fabrics are so great. Thanks to both of you for the great giveaway opportunities. There are going to be some over the moon happy winners this week. I love the newsletter already! Holly's designs are so luscious, I love them all! I met you in Puyallup last year and came home and immediately signed up for your emails. I love reading about the things going on at Shabby Fabrics! I had already taken a stab at applique when I stopped at your booth, but the way you explained it that day made me want to go home and try some new techniques. Thank you! I already receive your newsletter -- thanks for the chance to win such delightful prizes! I already receive your lovely newsletter! Thank you for this great giveaway. Unlikely I'll ever visit Paris, but still can live vicariously thru these beautiful quilting designs. I am a very happy subscriber to your newsletter - thank you for the generous giveaway! I am a subscriber to your email newsletter and always enjoy reading it and seeing what is new. I already receive and enjoy your email newsletter so much. I can't wait to buy the current Penelope line. I love the table runner I made with Penelope 3. Hi, I am a subscriber already and just updated. Love to see whats new and whats going on. Thank you for these wonderful giveaways!!! I'm already a subscriber and enjoy the email updates reminding me to come over to the blog to see what's new. Always something pretty to tempt me! Hey there, I already receive you e-mail updates and have to say I really enjoy them. Love the Shabby newsletter - I'm subscribed! I am already subsribed to the newsletter. Thanks for the giveaway. Love the Shabby newsletter .Thanks! I already subscribe to the newsletter. Thanks for the opportunity to win. I already subscribe but updated my info. Thank you for the chance to win. Hi! I already subscribe to your newsletter. I already get the newsletter. That's how I found out about these great giveaways! I love Holl's fabrics. I already receive the Shabby Fabric newsletter. Thanks for the chance to win. Love Love Love the newsletter. I have subscribed to the newsletter for quite a while and love the fabrics! I signed up for the newsletter (or I guess I should say I updated my profile since I already receive your newsletter) and thank you for the chance to win this fabulous giveaway! I have signed up for the newsletter as directed...I have been a suscriber for some time before. Love Lakehouse fabrics! 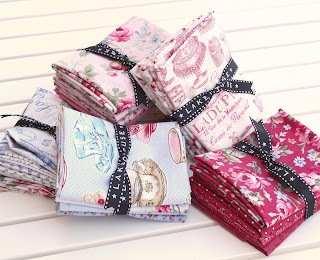 and love Shabby's selection of Lakehouse fabrics as well. I already subscribe to the The Shabby newsletter! Jen, Hi! I already receive the Shabby Fabrics newsletter. It is fabulous. I love her newsletter! Been getting it a while now. That's how I found you. I am already a subscriber (sam2172 at hotmail dot com)! Thank you!! Hi, I am already a subscriber, can't wait for newsletter to find out what's new! i always watch for the shabby to come into my mailbox ... one of my fav shop newsletters! I am already a subscriber also. Love your web site! Thanks for the giveaway!! I already receive your newsletter! Thanks for a chance at a great giveaway! Oh how fun. I've loved Shabby Fabrics and Lakehouse Dry Goods for a long time. I've also gotten your newsletter for quite a while now. Thanks for doing this. You gals rock!!! Hi, I'm already on your mailing list! Absolutely adore the fabrics. Thanks for the change to win! I am already receiving your newsletter. Thank you for the giveaway. I just love all the colors of the fabrics! I cannot get enough of those great colors. I already subscribe to the newsletter. I really like the Teacup Star Quilt pattern. It would go really nicely with my teacup collection. Thank you to all - Love those Shabby Fabrics and the Great Give-A-Ways. The colors are SEW perfect in the Teacup Star quilt. Nice job! I am signed up for your newsletter. I love the teacup pattern. I signed up for the newsletter and visited Holly's blog. Thanks for this opportunity to win. I signed up for the newsletter! Love it! Great giveaway! My daughter did a college semester in Paris and fell in love with that city. She's been back for a visit and still can't get enough of being there. Love your fabrics. I have been on your newsletter mailing list for quite a while now, but never followed the blog. After today, I am a follower! Thanks for a chance to win. These fabrics are so lovely. I've joined your newsletter mailing list. Love your fabric offerings. I've signed up for the newsletter. 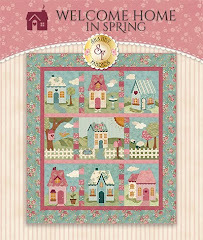 Thank you for such a great chance to win, the teacup pattern just sings to me as do these fabrics! I've been receiving your newsletters for quite some time and love them! Thank you so much for the chance to win!!! I am already receiving your email newsletters! Thank you! I was already signed up for the newsletter but I had to get entered in this giveaway because I LOVE Shabby Fabrics and Lakehouse!! I've been getting your emails for a long time and really look forward to them...love the sales! I'm already signed up for the e-mails! I am signed up for your emails! Thank you! I already receive your fabulous newsletter! I already receive your e-mails, and look forward to them. Already a follower, I'm loving Country Cottages.